The iGEM competition started at the Massachusetts Institute of Technology (MIT) in Cambridge, USA, in 2003. The aim was to encourage young students to try and solve real-world problems using genetically engineered organisms/machines. Now, over ten years later, iGEM has grown into the largest synthetic biology competition in the world and has enthused thousands of students from many different countries and studies with synthetic biology. 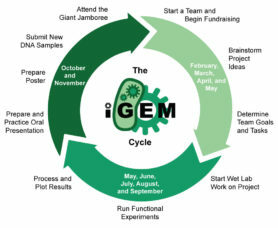 The iGEM competition is held yearly with the Giant Jamboree at the MIT being the grand finale where all teams have the chance to present their work and to win prizes in many different categories. Even though the Giant Jamboree is the highlight of every iGEM competition, the actual work happens in the months before it. Briefly, an iGEM year can be divided into three parts: 1. Team formation, brainstorming and project planning 2. Lab work and data analysis 3. Jamboree preparation. In iGEM, students are the head scientist, which means that their brainstorming can and should be free to go in any direction they like. Realistically, when it comes to planning the project, iGEM teams need senior scientists to help them figure out what they can and cannot do. Once the project is formed, the lab work commences, this is usually done in the summer months, i.e. the summer holidays of most students. After the summer months, it is time to wrap up the results and work on the presentation and the wiki. The wiki is of special importance to every iGEM team because the jury judges every team based on what is on their wiki – if it’s not on the wiki, it didn’t happen. Apart from the results and the data on the wiki, the success of an iGEM team also depends on their final presentation at the Giant Jamboree. every team gets the chance to give an oral presentation in front of the jury and the other teams and a poster presentation off-stage.